NEW ORLEANS – With the main section of the cross country season still a couple weekends away, few teams have run their entire "A" squads all at one time or to their full potential. 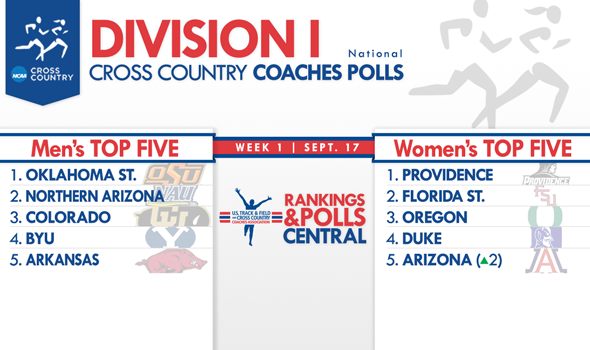 The result is a relative holding pattern in the first U.S. Track & Field and Cross Country Coaches Association (USTFCCCA) Division I National Coaches Poll of the regular season released Tuesday, in which only some minor shuffling has taken place atop the polls. Both the men’s and women’s polls saw just one shift each among their respective top-ten teams, but the season is still young with potential for much more movement as it shifts into another gear with the beginning of the countable season for at-large consideration on September 27. From that point forward, results against other teams will have an impact on the eventual determination of at-large teams to compete at the NCAA Championships. In addition, both the No. 1 Oklahoma State men and the No. 1 Providence women gained a first-place vote to their totals, giving the defending champion Cowboys 11 of the 12 and making the Providence women the consensus No. 1 with all 12. Holding steady behind OSU are No. 2 Northern Arizona, No. 3 Colorado, No. 4 BYU and No. 5 Arkansas. No. 6 Tulsa dropped out of a tie with the Razorbacks for the fifth spot, but is just one vote back. The Wisconsin men, national champions two seasons ago over Oklahoma State, sustained the largest drop by a squad of either gender with a three-slot slide to No. 10. Shifting up one spot each as a result were No. 7 Portland, No. 8 Syracuse and No. 9 Princeton, which is at an all-time program high in the rankings. No. 19 Georgetown gained the most ground, jumping five spots, while Columbia tumbled the farthest with a nine-position drop to No. 27. New to the polls this week are No. 24 Providence, No. 28 Arizona State and No. 30 Illinois, which is tied with Big Ten foe Michigan State and is ranked for the first time in more than 15 years. On the women’s side, Pac-12 foes Arizona and Washington switched preseason positions to come in at No. 5 and No. 7, respectively. The Wildcats looked strong in winning their opener at Northern Arizona, while Washington must now move on without perennial All-American Megan Goethals, who suffered a season-ending stress fracture. The good news for the Huskies is the return to form of Katie Flood after injuries derailed her 2013 track season. Arizona rounds out a top five that includes unanimous No. 1 Providence, No. 2 Florida State, No. 3 Oregon — which lost its first-place vote to the Friars — and No. 4 Duke. Elsewhere in the top 10, Cornell and Arkansas swapped spots to No. 9 and No. 10, respectively. No team made astronomical leaps or drops in the rankings, as Arizona, No. 14 William and Mary and No. 25 Texas all gained two spots, while Washington fell the hardest by two spots. The lone addition to the top-30 was BYU at No. 27. The NCAA Division I National Championships will be contested in Terre Haute, Ind., on November 23. Others Receiving Votes: Virginia Tech 12, Georgia 11, Air Force 10, North Carolina 8, Dartmouth 8, Boise State 7, Duke 7, Washington 5, Missouri 3, Furman 3. Others Receiving Votes: Weber State 24, Connecticut 20, Syracuse 13, Florida 10, UC Davis 7, Georgia 5, North Carolina 4, Toledo 3.